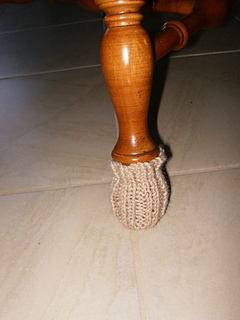 These easy chair socks fit snugly to a diameter of 2 to 3 inches, using fine or superfine yarn and a pair of 3.5mm needles. Gauge is 20 stitches in stockinette for 4 inches. Height depends on the shape of your chair leg and personal preference. 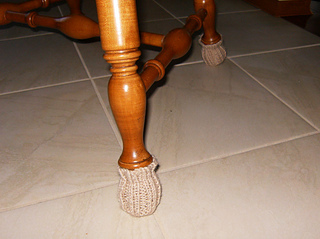 Yarn used was a durable, machine washable fibre.